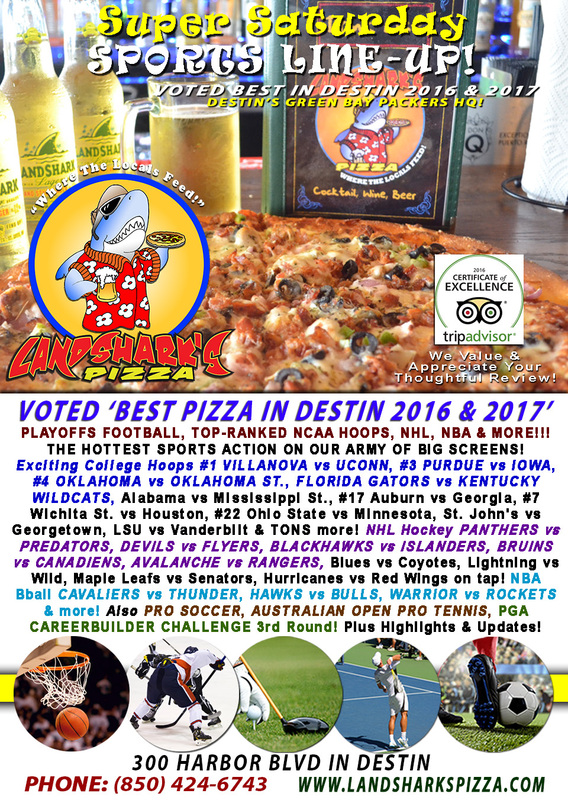 / Best Calzone in Destin FL / Now That is One TASTY Calzone at Landshark’s FREEDOM FRIDAY TWO-TOPPING CALZONE & Brew $9.99! 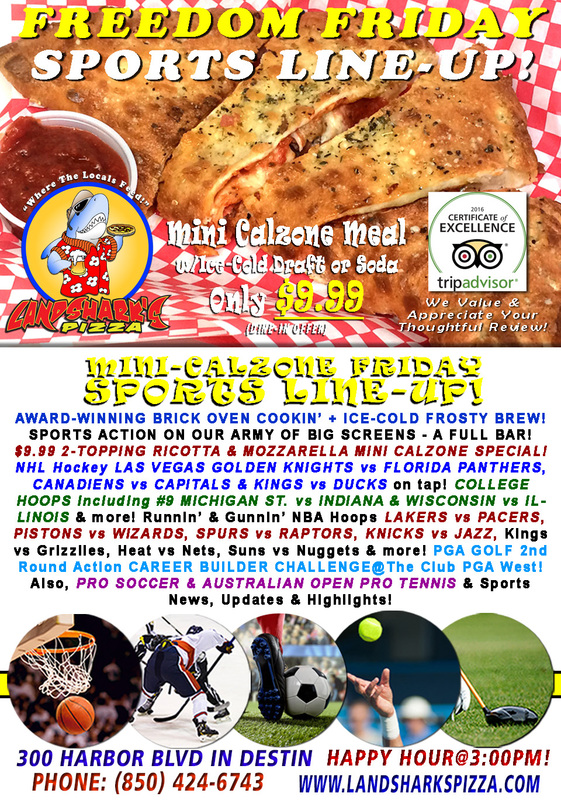 Now That is One TASTY Calzone at Landshark’s FREEDOM FRIDAY TWO-TOPPING CALZONE & Brew $9.99! IT’S GONNA BE IN THE 60’S TODAY IN DESTIN – YIPPEE! TIME TO THAW OUT WITH PIPING HOT ITALIAN GOODNESS AT LANDSHARK’S! 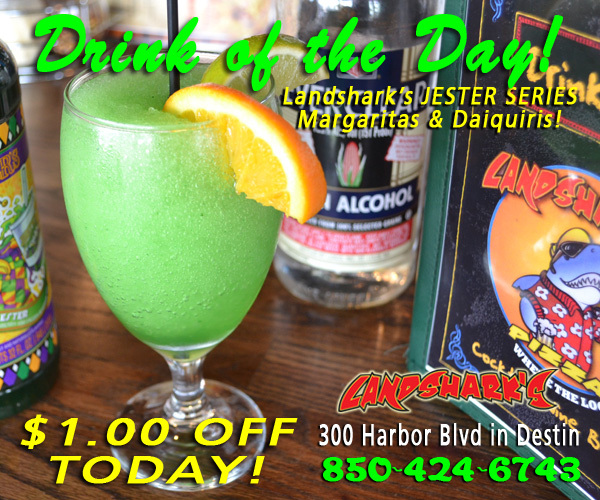 LANDSHARK’S DRINK OF THE DAY – $1.00 (One whole frogskin) OFF our delicious ‘JESTER MARGARITAS’ – Watch sports, enjoy company with good folks and sip away! SPORTS ON OUR ARMY OF BIG SCREENS – Exciting COLLEGE BASKETBALL including #9 MICHIGAN ST. vs INDIANA & WISCONSIN vs ILLINOIS! NHL Hockey GOLDEN KNIGHTS vs PANTHERS, CANADIENS vs CAPITALS & KINGS vs DUCKS on tap! Runnin’ & Gunnin’ NBA LAKERS vs PACERS, PISTONS vs WIZARDS, SPURS vs RAPTORS, KNICKS vs JAZZ, Kings vs Grizzlies, Heat vs Nets, Suns vs Nuggets & more! PGA GOLF 2nd Round Action CAREER BUILDER CHALLENGE@The Club PGA West! Also, PRO SOCCER & AUSTRALIAN OPEN PRO TENNIS coverage plus plenty of other Sports Broadcasts, Sporting News, Analysis, and Commentary! 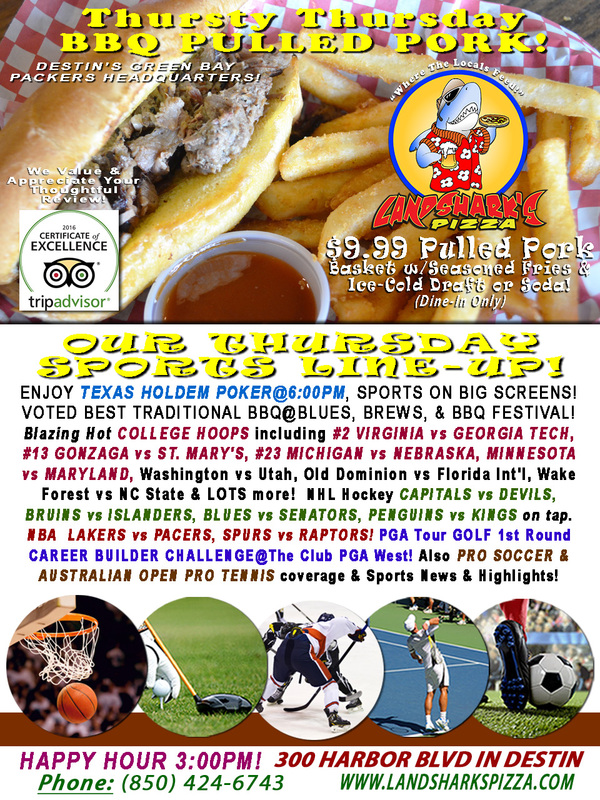 Previous Post: « 1st Place BBQ & Brew $9.99|#2 VIRGINIA vs GEORGIA TECH NCAA HOOPS & TEXAS HOLD’EM POKER!